At this point it is clear that the response of monetary and fiscal policy in Romania to the economic crisis of 2007-2008 represents a permanent output loss. This has dire consequences for the future development of Romania which is the poorest country in the EU. These views are part of a more comprehensive analysis of this issue but I want to show you four important things today. 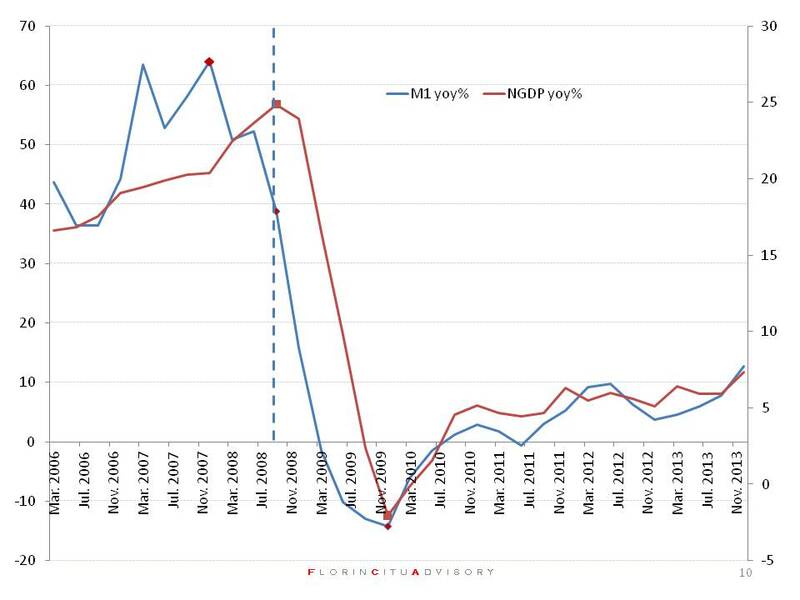 First, monetary policy was pro- cyclical- high money supply growth (M1) until December 2007 and an abrupt decrease to negative money supply growth after that. The peak of money supply growth is in December 2007 while the peak of NGDP growth is in September 2007. 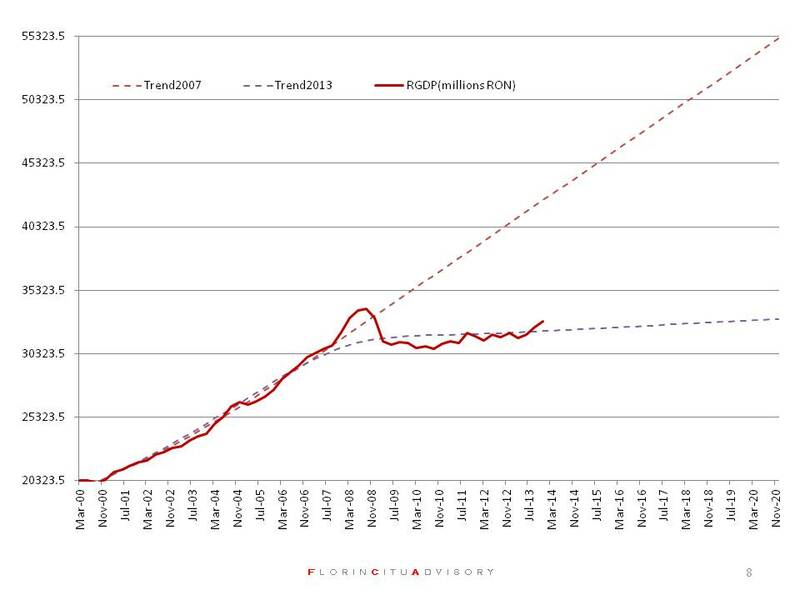 In the 9 months money supply growth decreased from 64% per year to 38% per year. Most importantly, the minimum for both money supply growth and NGDP growth is in December 2009 (one year after the exogenous negative shock of October 2008). Monetary policy continued to remain tight for a long period after October 2008 while most of the global central banks were relaxing monetary policy or at least keeping money supply growth constant. Second, monetary policy targeted mainly the exchange rate and only secondary inflation. It is true that the exchange rate has been less volatile but it did follow the pattern we observe in countries with currency boards: relative stability followed by a big devaluation. However, relative exchange rate stability came with a big real cost for the economy: volatility in the interest rates and inflation. 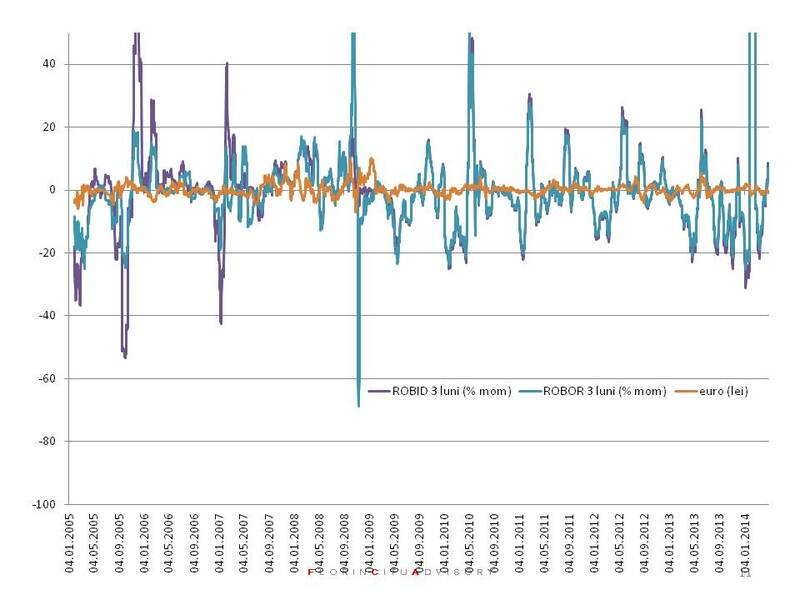 Interest rate volatility, especially in the interbank market, represented funding costs uncertainty for banks which was transferred to clients via higher premium for the RON lending market. An unintended consequence of this policy was that it made foreign exchange loans more attractive. Thus interventions in the FX market acted as a subsidy for both supply and demand of FX denominated loans. Bottom line, FX interventions were not free and worst of all were also pro -cyclical with real costs for the economy. Third and fourth, the pro-cyclical monetary and fiscal policies pushed the economy permanently to a lower long term growth path. I present two growth scenarios (estimates from pure econometric models). 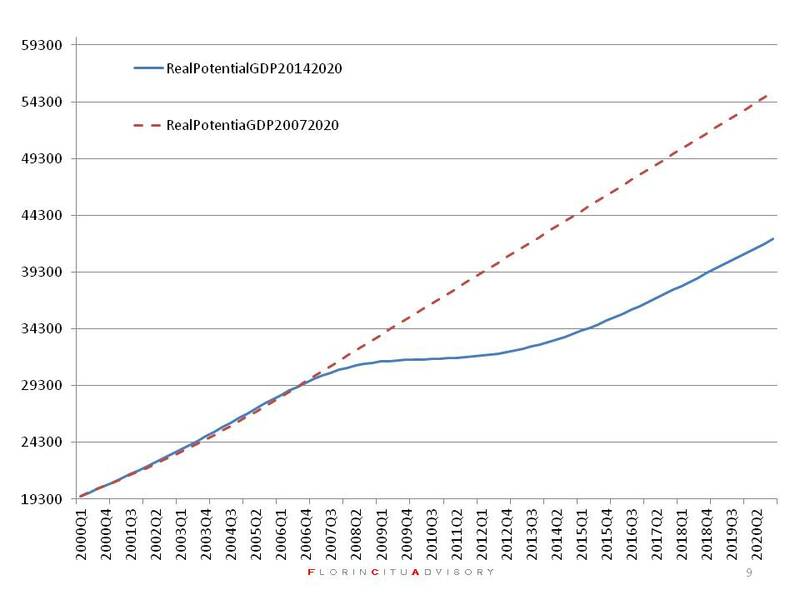 The first scenario shows Real GDP potential (million RON) estimated for the period 2007 -2020 (assuming the growth path from 2007) and the period 2014-2020 (assuming a realistic scenario of the economy converging to 2.5% annual real GDP growth). In this case the permanent output loss gets larger and larger over time. In the second, more optimistic, scenario I assume that the economy settles to an average real growth of 3.8% per year from 2015 onwards. However, even in this case it is not enough for the economy to recover the cost inflicted on the output by the pro-cyclical monetary and fiscal policies. To eliminate the output loss, transform it from permanent to temporary, Romania needs economic policies that will deliver average real growth closer to 6% per year. An inconceivable scenario considering the economic policies of the last 10 years and that going forward it will be the same group of people in calling the shots. Please do not use graphs without permission from the author. De ce nu mai crede BNR ce spunea in 2008 despre excedentul net de lichiditate*? Dan, there is one problem with that presentation: it does not show INFLATION 🙂 . If they will show you the graph of inflation vs key policy rate and you consider the policy lag then a new story arises.